Association of platelet counts with portal venous pressure (PVP). Platelet counts (PLTs) at 14 days and 3 months after the transplant correlated well with PVP at the end of surgery. Regression equations at 14 days and 3 months after transplant are PLT = 41.92 − 1.20 × PVP (r = −0.73) and PLT = 25.60 − 0.57 × PVP (r = −0.62), respectively. Platelet counts after live donor liver transplant (LDLT). Data are expressed as mean ± SE. A, Platelet counts in relation to portal venous pressure (PVP) and splenectomy (SPN). Platelet counts in the 13 patients with a low PVP increased significantly after the transplant, whereas platelet counts remained suppressed in the 8 patients with a high PVP. Seven patients who underwent a simultaneous SPN showed a remarkable increase in their platelet counts after the transplant. * P < .005 (with vs without SPN). † P < .05 (with vs without SPN). ‡ P < .01 (low vs high PVP). § P < .05 (low vs high PVP). B, Platelet counts in relation to graft size. Platelet counts in the 11 patients with a graft volume to standard liver volume ratio (GV:SLV) greater than 0.55 tended to increase, whereas they were almost even after transplant in the 27 patients with a GV:SLV ratio less than 0.55, although the differences were not statistically significant. || P < .05 (large vs small grafts). Hypothesis Perioperative variables, including portal venous pressure (PVP) and graft size, can predict thrombocytopenia after living donor liver transplant (LDLT). Patients Forty-five adult patients with liver cirrhosis who underwent LDLT without splenectomy (n = 38) or with simultaneous splenectomy (n = 7). 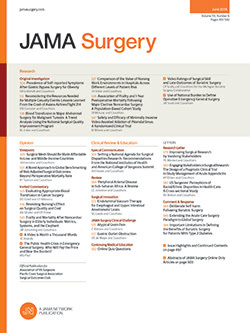 Main Outcome Measures Preoperative and postoperative platelet counts and perioperative variables of recipient age, preoperative Model for End-Stage Liver Disease score, donor age, graft volume to standard liver volume ratio, PVP, cold and warm ischemia times, blood loss, and surgical complications. Results In the 38 recipients who did not undergo splenectomy, there was a strong correlation between PVP at the completion of the transplant and the platelet count (at 14 and 28 days and at 3 months). A high PVP (≥ 25 mm Hg) correlated with posttransplant thrombocytopenia, as did a small graft. Patients undergoing a simultaneous splenectomy had sufficient platelet levels at each measurement, irrespective of the graft volume. Conclusions Portal venous pressure and graft size were associated with posttransplant thrombocytopenia. Splenectomy is an option in cases with a high PVP or a small graft, especially for patients receiving postoperative interferon therapy for hepatitis C virus. In this study, we aimed to clarify the relationship between perioperative variables, including PVP, graft size, and thrombocytopenia, after LDLT. We hypothesized that perioperative variables, including PVP and graft size, would predict thrombocytopenia after LDLT. We retrospectively reviewed the data of LDLT recipients in our hospital. We found 56 adult patients who underwent LDLT from January 1, 1998, through August 31, 2005. We excluded 6 patients with fulminant hepatic failure and 1 with citrullinemia who underwent auxiliary partial orthotopic liver transplant. As a result, 49 recipients (42 who did not undergo splenectomy [hereinafter referred to as without splenectomy] and 7 who underwent simultaneous splenectomy [hereinafter referred to as with splenectomy]) were the subjects in this study. Among these, 4 patients without splenectomy died within 3 months after liver transplant due to acute heart failure (n = 1), sepsis (n = 1), portal venous thrombosis (n = 1), and persistent acute cellular rejection (n = 1). These patients were excluded from the analysis. In the remaining 38 recipients without splenectomy and the 7 recipients with splenectomy, the following items were evaluated and noted: preoperative platelet counts at 7, 14, and 28 days, 3 and 6 months, and 1 year after the transplant (until prophylactic interferon therapy was started in recipients with hepatitis C virus); recipient age; preoperative Model for End-Stage Liver Disease score; donor age; graft volume to standard liver volume ratio (GV:SLV ratio); PVP at the completion of the procedure; cold and warm ischemic times; blood loss; and surgical complications. Portal venous pressure was obtained via an intravenous catheter placed in a tributary of the superior mesenteric vein during the transplant in 21 recipients. We divided patients into the high PVP group (≥ 25 mm Hg) (n = 8) and the low PVP group (< 25 mm Hg) (n = 13), according to their PVP at the completion of the procedure. A standard immunosuppressive regimen consisted of a calcineurin inhibitor, with or without a corticosteroid, with or without mycophenolate mofetil, and with or without anti–interleukin 2 receptor antibody. Platelets were not transfused until the platelet count had dropped to less than 20 × 103/μL (the conversion to cells × 109/L is a 1-to-1 conversion). In 2 patients, preemptive interferon therapy was initiated by 3 months after the transplant, and data collected at that time were not counted for either patient. Ganciclovir sodium and a combination of trimethoprim and sulfamethoxazole were administered routinely for 10 days and 6 months, respectively, after LDLT in each patient. The statistical analysis used the Mann-Whitney test for nonparametric data and the Pearson correlation test to examine the correlations among the variables. A P < .05 value was considered significant. The demographic characteristics of the recipients are shown in the Table. A comparison between the high and low PVP groups showed that the GV:SLV ratio was smaller and donors were older in the high PVP group, although these differences did not reach statistical significance. The patients experienced stable allograft function, without any surgical complications or recurrence of primary disease. Morbidities associated with platelet counts or splenectomy are shown in the Table. Bleeding episodes tended to be more frequent in the high PVP group, although this difference did not reach statistical significance. Two patients with splenectomy developed retroperitoneal hematoma within 3 days after the transplant, when their platelet counts were less than 50 × 103/μL. Sepsis was not observed in recipients with splenectomy. Possible causes of drug-induced thrombocytopenia were similar between the low and high PVP groups. No drug therapy was discontinued because of drug-induced thrombocytopenia during the study. Mycophenolate was used in 39 patients (87%) (including all of the patients in the high and low PVP groups). The mean duration of mycophenolate administration was 3.6 months in the low PVP group and 1.7 months in the high PVP group (P = .17). Cytomegalovirus infection was observed in 3 patients (1 in the low PVP group and 2 in the high PVP group), and was treated with ganciclovir for 15 days in the patient in the low PVP group and 17 days in the patients in the high PVP group. In the 38 recipients without splenectomy, there was a strong correlation between PVP at completion of the transplant and the platelet count (at 14 days, 28 days, and 3 months; r = −0.728, −0.627, and −0.620, respectively) (Figure 1). The GV:SLV ratio, preoperative Model for End-Stage Liver Disease score, and warm ischemia time also had some correlation with postoperative platelet counts, although these associations were much weaker than that of PVP. We found no association between preoperative and postoperative platelet counts. The platelet counts for LDLT recipients in the low and high PVP groups without and with splenectomy are shown in Figure 2A. The platelet count in the low PVP group increased to greater than 100 × 103/μL by 14 days after the transplant, whereas it remained as low as less than 100 × 103/μL in the high PVP group, a difference that was significant. The GV:SLV ratio in the high PVP group differed by less than 0.55 (Table); therefore, we compared the time course of platelet counts between recipients with a large graft (GV:SLV ratio > 0.55) and those with a small graft (GV:SLV ratio < 0.55). The platelet counts of all recipients without splenectomy (n = 38) showed increased platelet levels in recipients with large grafts, whereas it remained suppressed in recipients with small grafts (Figure 2B), although the difference was not statistically significant. Patients with splenectomy had sufficient platelet levels at each measurement, irrespective of the graft volume (Figure 2A). Portal venous pressure at the end of surgery ranged from 18 to 23 mm Hg. Morbidity associated with splenectomy was observed in only 1 recipient (14%), who underwent reoperation for a retroperitoneal hematoma on postoperative day 10. Liver cirrhosis with portal hypertension often accompanies thrombocytopenia of various causes. Advanced hepatic fibrosis or augmented splanchnic flow to the portal venous system under cirrhotic conditions results in hypersplenism and thrombocytopenia.6,7 A low thrombopoietin level in the blood, which is regulated by portal venous hemodynamics, causes thrombocytopenia in cirrhotic patients.6,8,9 Posttransplant thrombocytopenia can be induced by decreased thrombopoietin levels.10 Platelets are also absorbed in grafts11 and destroyed by platelet-associated IgG in patients with hepatitis C virus.12 Although thrombocytopenia is one of the risk factors for morbidity after LDLT, we are aware of no report about the influence of portal venous hemodynamics and graft size on postoperative platelet counts. Among the perioperative clinical factors, PVP was the most significant determinant of platelet counts after LDLT. This is reasonable because PVP, which is influenced by the graft portal venous vascular resistance and the recipient's splanchnic flow to the portal vein, is closely related to splenomegaly and hypersplenism.13 The GV:SLV ratio is related to PVP14 and is therefore indirectly related to platelet counts after LDLT. A GV:SLV ratio of less than 0.55 corresponded to the high PVP group without splenectomy in our cohort, in whom postoperative platelet counts remained low. Platelet counts in each group after LDLT were stable for as long as 12 months, despite liver regeneration and improvement of graft function (Figure 2A). We previously reported that PVP remained almost unchanged during the first 3 weeks after right-lobe adult-to-adult LDLT.15 The present results suggest that PVP remained unchanged (high in the high PVP group) for a long time, and even the liver regeneration and graft function were stabilized after LDLT. Because of these results, we now perform a splenectomy in patients in the group at high risk for thrombocytopenia after LDLT. The feasibility and usefulness of increasing platelet counts after LDLT with simultaneous splenectomy were reported by Cescon et al17 and Kishi et al.18 Potential morbidities associated with splenectomy include bleeding, hematoma, leakage of pancreatic juice, and infection. Kishi et al18 reported that splenectomy was performed concurrently with LDLT in 21 patients, 6 (29%) of whom had morbidities of infectious diseases, a finding similar to that of the control group without splenectomy. Among 7 splenectomy recipients in our series, only 1 developed a retroperitoneal hematoma and required reoperation. Another patient in the splenectomy group developed thrombosis of the splenorenal shunt, which was uneventfully reduced with anticoagulant therapy. Careful surgical procedure could minimize the morbidity associated with splenectomy. The incidence of infection may increase after splenectomy. Streptococcus pneumoniae is the most prevalent causative organism of severe infection after splenectomy in children not undergoing transplantation, and vaccination is recommended,19 but vaccination is unnecessary in adult patients.5 The risk of infection in the liver transplant population has not yet been clarified. Neumann et al20 reported that simultaneous splenectomy increased the risk for opportunistic pneumonia, but none of our recipients with splenectomy developed any clinically obvious infection. Therefore, prophylaxis, such as preoperative vaccination, and careful monitoring for infection after LDLT are recommended. Splenic artery ligation at the time of surgery is another option for preventing hypersplenism. Several reports have described how splenic artery ligation decreased portal venous flow and prevented small-for-size syndrome in partial liver transplant.5,21 However, one report22 stated that thrombocytopenia failed to improve in patients with splenic artery ligation after liver transplant, suggesting that splenic artery ligation may be inadequate to avoid thrombocytopenia after liver transplant. Partial splenic embolization is another alternative. This procedure is less invasive and effectively increases the platelet count in cirrhotic patients.23 It is possible to perform partial splenic embolization before scheduled LDLT. One should consider performing partial splenic embolization during surgery for LDLT, but always be aware that there is a risk of life-threatening adverse effects in patients with end-stage liver disease. In conclusion, PVP and graft size were associated with posttransplant thrombocytopenia in this study. Splenectomy is an option in cases with a PVP greater than 25 mm Hg after reperfusion or a GV:SLV ratio of less than 0.55, especially for patients receiving postoperative interferon therapy for hepatitis C virus infection. Correspondence: Keizo Dono, MD, PhD, Department of Surgery and Clinical Oncology, Osaka University Graduate School of Medicine, 2-2 Yamadaoka, Suita City, Osaka 565-0871, Japan. Accepted for Publication: April 23, 2006. Author Contributions:Study concept and design: Marubashi, Dono, Nagano, and Monden. Acquisition of data: Marubashi, Takeda, and Umeshita. Analysis and interpretation of data: Marubashi, Miyamoto, Takeda, Nagano, and Umeshita. Drafting of the manuscript: Marubashi, Dono, Miyamoto, Takeda, Nagano, and Umeshita. Critical revision of the manuscript for important intellectual content: Marubashi and Monden. Statistical analysis: Dono. Administrative, technical, and material support: Miyamoto and Monden. Study supervision: Dono and Monden.